Due to forecasted thunderstorms on April 14, the Amazing Race has been rescheduled for Saturday, July 7. The CWPD Amazing Race returns this spring! Race other teams as you travel to various parks completing mental and/or physical challenges at each stop. Be the first team to complete the race for the ultimate grand prize! 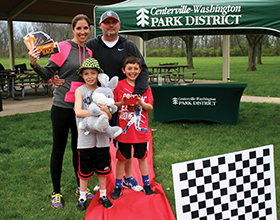 The Amazing Race begins at Yankee Park on Saturday, April 14. Check-in starts at 8 a.m. and the race will begin at 9 a.m. The race should be completed by around noon, depending upon your team! Team maximum of 5 people. Team members must be ages 7 and up. Each team will need a driver, but the driver does not have to be part of the team.